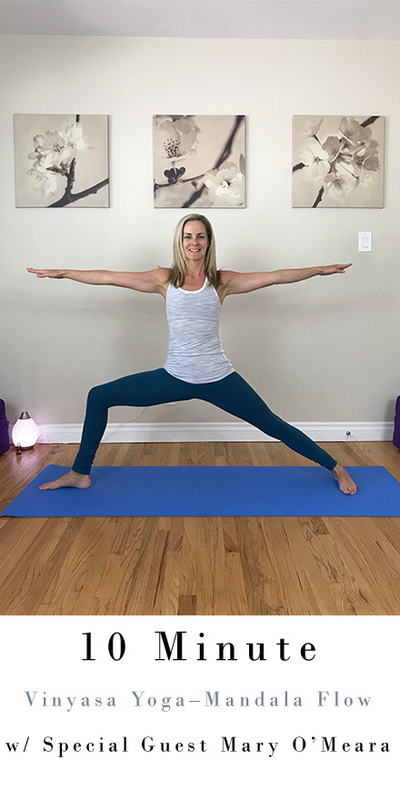 In this 10 minute Vinyasa Flow class, you will have a chance to warm up the body with half Sun Salutations and a fun Mandala Flow. We will work in a circle on our mats, moving connected to our breath and mind. Mandala Flows really allow us to tune in to the movement we are doing, and leaves little space for the thoughts to come in. We will work from head to toe with this fun, yet light hearted Vinyasa Flow. We utilize Frankincense essential oil to get nice and grounded with out flow. Frankincense helps us to connect in to our truth, yet up to our higher selves. It is the best of both worlds as we infuse our practice with it. Enjoy, from my and hO’Me to yours 🏼. Mary’s classes focus on the mind, body, emotion, spirit connection. Mary believes that where there is dis-ease within the body, there is an emotional root connected to it. The more we can clean these roots out, and keep them flowing, the less dis-ease we will have within the body. Her classes will build physical strength all the while creating space for our souls to shine brighter as we clear out the “junk”. Her use of essential oils is intentional, to empower us to live feeling as we are meant to, healthy and happy. She uses oils that were created with the highest intention in mind, as well as knowing the farmer. Mary will guide you on a journey to live an empowered life with every system in the body, from immune function to hormone function. Release emotions, find freedom, feel good! Mary lives in Los Angeles, California, her YouTube journey began almost 2 years ago when she realized that yoga was meant for the world, not just to be confined within the walls of a studio! She has found such a passion for sharing her practice and teachings with the world. She didn’t know she could love teaching as much as she does today! Mary posts weekly on O’M Yoga, more often than not you will find them on Monday mornings, for Mary Mondays of course! She offers a wide variety of classes, from 15 minutes up to 60, there will never be an excuse of “not enough time” with her channel. Her classes are filled with options, new will not feel left behind and advanced practitioners will not be bored, pick the layer that works best for you. Her yoga will leave you feeling invigorated, strong, empowered, and relaxed (after savasana of course! ).